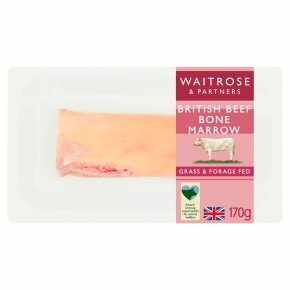 Roast bones in the oven until they gently bubble, spread the marrow onto sourdough toast, top with a salad of capers, parsley and shallots with a squeeze of lemon. Expertly prepared from prime cattle which are reared on a forage based diet on carefully selected British farms. We work with a long established group of dedicated British beef farmers, selecting them for their high standards of animal husbandry, welfare and commitment to sustainable farming. Were always looking for ways to reduce our environmental impact, which is why were moving to this packaging on a selection of fresh meat. It reduces the amount of plastic and gives you an outstanding quality product. With benefits that include: - Reduces waste - Easier to store - Improved eating quality. Roast the bones in the oven until they gently bubble, spread the marrow onto sourdough toast, top with a salad of capers, parsley & shallots with a squeeze of lemon.